1 in 7 Women Still Tan After Skin Cancer Diagnosis. Would You? My mother used to tan. Although tanning beds too closely resembled coffins for me to ever lie in them, my mother would frequent them faithfully each summer to turn, as I would joke, "a deeper peach". But though I'd never crawl into a UV chamber, I wasn't too much better than her. Equally fair-skinned, I worshiped the sun growing up. I would bake outside for hours, sans sunscreen, just to achieve that coveted bronze complexion. However, after an eight-hour tanning stint left me "crispy" six months afterwards, I began to wonder how detrimental my tanning habits were to my skin health. I started to analyze the neurosis that initially drew me to lie out. Throughout school, I was teased by my black peers for being too "white". Snide jeers such as "light bright" and "house slave" were commonplace. On more than one occasion, peers clapped in my face and sang the commercial jingle for "clap on". My light complexion made me feel highly visible wherever I went, even isolated. I resented it and blessed summer for turning my skin brown. But, after that one occasion, I realized my desire to conform to a certain aesthetic was not only misguided — it was dangerous. Putting myself at the mercy of UV rays also put me at the risk of skin cancer. The tradeoff wasn't worth it; I stopped obsessing and met a bottle of Coppertone, stat. I believe that I came to my senses about tanning early. But what about those women who've already been diagnosed with skin cancer? Shockingly, Jezebel reports that as many as one in seven women continue to tan after a skin cancer diagnosis. But why? I asked some peers for their input on the issue: Do the benefits of tanning booths outweigh the cons? Sarah, 18, reasons that tanning is safe and convenient in moderation. "I went to a tanning bed this past year and the year before that for prom because I ran track and had really bad tan lines. 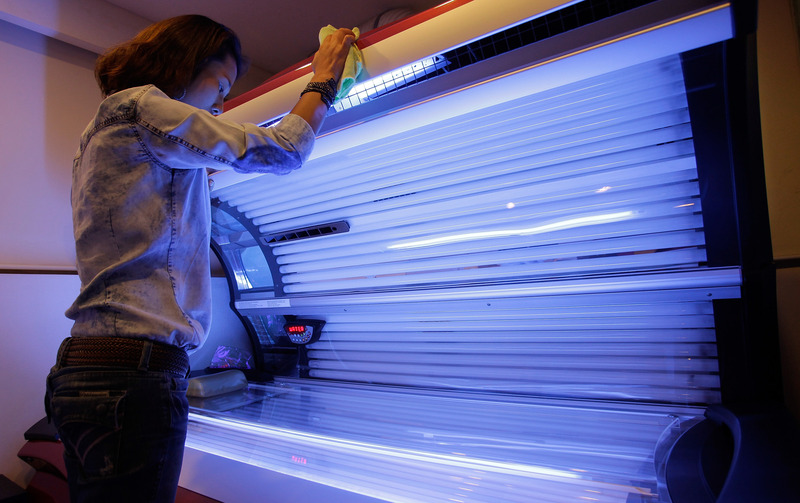 I understand the risks of skin cancer, and I wouldn't do it for an extended period of time, but it was a quick fix for even tanning before prom on a time crunch." Also advocating for the practice, Tracy, 24, says, "I love tanning. I'm naturally really pale and it makes me feel —and I think — look better. I've heard the stuff about skin cancer but it's not like I do it all the time." Katherine, 20, counters that tanning salons are still risky. "I hate [tanning salons]. I'm scared of getting skin cancer and they make your skin leather. I don't think the benefits outweigh the risks." Julie, 19, shares Katherine's sentiments. She further argues that a medical diagnosis definitely warrants action. "...if they have skin cancer, they should stop tanning. [Because] nine times out of 10, that's why they got it." So, why would women continue to ignore their skin health? Sarah-Kathryn, 20, posits that obsessive tanning may represent more of a psychological issue than a physical one. Although she maintains that she is not "well-informed about the risks", she says, "I feel that tanning is a way of throwing money at a culturally-instilled body image problem, which terrifies me." Obsessive tanning represents an internalized discomfort with one's outer appearance. It's a temporary fix for a deeper problem. Let's look beyond the tan to what's really wrong, and stay out of the booth in the meantime.